te and connect with some of the latest apps, devices, or communications protocols. But all of that has changed with Zebra Technologies’ new ZT600 Series industrial printers. The ZT600 Series is an ultra-rugged, durable, and reliable barcode and RFID printer that combines the brawn of an industrial-strength device with next-generation brains and adaptability. The end result is a future-proof printing solution that’s far easier to integrate, operate, and upgrade. Here’s a quick breakdown of the many breakthrough improvements Zebra has unveiled with the ZT600 Series. Like the unbeatable Xi4 Series that came before it, Zebra’s ZT600 Series printers are built to withstand the most demanding industrial environments and print high volumes of labels with superior print quality and speed. Each printer is manufactured with all-metal structural components, built-in thermal management, and high-quality print mechanisms to ensure continuous, extremely reliable performance in the most demanding industrial applications. 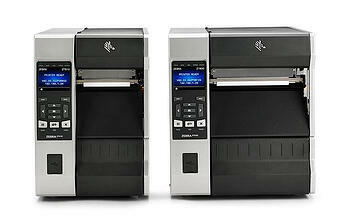 ZT600 Series printers are available in 4” and 6” print widths with optional UHF RFID. They also support field-installable media handling options such as a label cutter and rewinder, and you can even upgrade your printer with RFID encoding capabilities without sending it in for servicing. ZT600 Series printers include compatibility with SOTI and AirWatch device management software, plus intuitive Link-OS applications and tools that simplify updates and reconfiguration. Zebra’s apps also make it easy to create custom printing solutions tailored to your unique business needs. Highly precise registration and print line adjustment provide 600 dpi printing for labels as small as 3mm, so you can print small and high-quality labels for circuit boards, microchips, and miniature components. With the ZT600 Series, Zebra has enabled an array of connectivity options, including Bluetooth, gigabit Ethernet, USB, serial, and dual USB hosts. Two open communication slots provide additional connectivity options, including parallel, 802.11a/c, an applicator port, IPv6, and Bluetooth LE. One of Zebra’s best innovations is the simple and intuitive side-loading of print media. Each ZT600 printer’s interior illuminates the ribbon and media paths. The same paths change color when errors occur, so you can quickly locate and resolve any issues. Additionally, a highly visible color graphic display features an intuitive icon menu and local language support. It’s clearly visible, even from a distance, and the display turns red when there’s an error or yellow if the printer is paused. If an error occurs, the display also shows QR codes with convenient links to videos to help resolve the issue. The ZT600 Series includes Zebra’s Link-OS operating system, which makes it easy to integrate your printers and manage and monitor them remotely. You can monitor networked Link-OS printers from a single user-friendly browser interface, with dashboards for system diagnostics, guided instructions, and feedback. Link-OS also provides applications to simplify printer updates and reconfiguration as needed, plus cloud services to provide secure access to printing operations from anywhere. If you’re considering an upgrade in your industrial printers, we highly recommend Zebra’s new ZT600 Series. You’ll get rugged reliability and best-in-class performance in a future-ready device that’s much easier to manage, integrate, and upgrade. To learn more, visit our Go-Label.com web site and see our competitive prices with complete specifications. 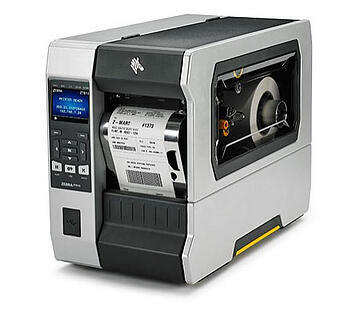 You can also get the ribbons and labels you need to keep you ZT600 Series printer running in top form.